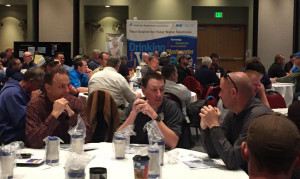 With a name like “How to Survive an Alien Invasion on Your Water System,” who knew quite what to expect April 6 when the Intermountain Section of the American Water Works Association brought its 2016 Educational Extravaganza back to Salt Lake City? Take your pick of topics: algal blooms, this past year’s oil spill on the Provo River or the topic of the day—the water contamination crisis in Flint, Mich.
On a lighter note, several of the 150 attendees took on the Meter Madness Challenge, furiously assembling a bucket of parts into a functioning residential water meter. “The fastest person will go to the national AWWA conference this June in Chicago,” Hoyt said. The day closed with a look at the future, via Envision Utah’s recent survey. More than 53,000 Utahns responded, with water concerns No. 2 on their list. “Traditionally, water doesn’t even make it to the table,” Hoyt said. “But with our population growing, people wonder where the water will come from. And they very clearly let it be known that taking it from local agriculture is not acceptable. More pressing at the moment is CUWCD’s mission to remove 5 million pounds of carp from the district’s waterways. Knowledge of that number won Ryan Goodrich from the Ashley Valley Water & Sewer Improvement District and Brady Pobst from Jordanelle Special Service District an emergency backpack water filter.